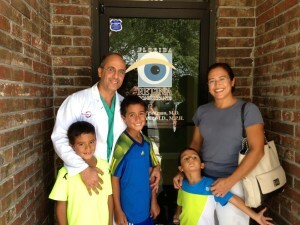 I a m a retina specialist practicing in Central Florida: Orlando, Lake Mary and Lakeland. As a retina specialist, I treat and perform eye surgery on patients with macular degeneration, diabetic retinopathy, retinal detachments, macular holes, floaters, macular puckers/epiretinal membranes, and eye trauma. My wife, Brenda, and I settled in the Orlando, Florida area after I finished my fellowship to become a retina specialist. Brenda is also a doctor. She and I met at Georgetown University Medical Center. She is an Ob/Gyn. To become a retina specialist, I had to complete a fellowship allowing me to subspecialize. My specialty is ophthalmology whereas my subspecialty is a retina specialist. My residency at Georgetown University Medical Center allowed me to provide general eye exams and my fellowship at the University of California, Irvine Medical Center allowed me to subspecialize as a retina specialist. To completely roundout my education, I completed a Masters of Public Health (MPH) degree from Johns Hopkins University. take care of patients with different retinal issues; macular degeneration, diabetic retinopathy, complications of cataract surgery, retinal tears, flashes/floaters, detached retinas, and retinopathy of prematurity. I am very proud of the care we provide our patients with retinal problems. We work closely with your primary care physician, optometrist and referring ophthalmologist to provide the most timely, modern, and comprehensive retina care possible. optical coherence tomography (OCT). We have employed a brand new computerized record keeping system to make our office green and environmentally friendly (as well as super-efficient!). Not everybody has equal access to a retina specialist nor a quality education. Professionally, I’ve developed relationships around the world. I’ve traveled to Africa and Central America to volunteer my surgical skills. Brenda and I also established the Moinfar Family Scholarship at Johns Hopkins in honor of my father. This fund supports graduate studies to qualified students to help them achieve their academic dreams; quite often the recipients are international. several marathons including the Chicago Marathon and the Disney Marathon. I am a big aviation enthusiast, and love everything about flying. I hold a private pilot’s license, and for many years, served as a Designated Medical Examiner for the Federal Aviation Administration. questions or call ………..to schedule an appointment: 877-245-2020 (24/7/365).